Bletilla striata is garden hardy. I was surprised at first but some orchids can grow in the ground, and quite well at that. The survival of the Chinese Ground Orchid is much better with well drained soil. Bletilla striata can handle a moderate amount of summer water and fairly heavy soils, something short of clay and a bog. 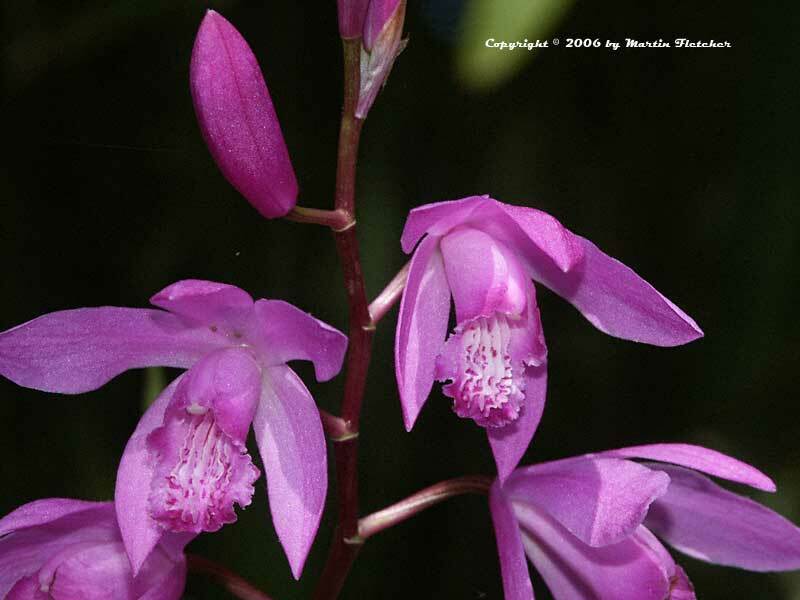 Winter in our area is unlikely to be a problem, Bletilla striata is hardy to well below zero. Bletilla striata produces beautiful purple flowers in the early spring for about 6 weeks. This clump will have upwards of 50 blooms open at any time during that period. Bletilla striata is about a foot tall. I have seen Bletilla striata growing in the sun but the foliage always seems to look pale and burnt. My most successful plantings of the Chinese Ground Orchid have strong light but have been in an area that was protected from the mid-day sun. There is a white variety of this plant, Bletilla striata alba. Purple Flowers of Bletilla striata the Chinese Ground Orchid. High resolution photos are part of our garden image collection.